Gozo's leading holiday rental provider. A selection of over 30 farmhouses with private pool and 50 apartments with shared pool. Gozo Village Holidays has over 30 years of experience in holiday rentals with a dedicated and professional team behind your stay. Book direct on our official website for best prices and offers. Simon Mamo Real Estate is the leading Malta Real Estate Agency. If you are searching for Malta Property you will be delighted with our vast selection of Malta Properties for Sale, Property to Let in Malta, as well as Commercial Leasing services. With more than 30 years experience in the Real Estate Malta industry, we are confident we can help you find the ideal property for you. Move2Gozo, recent winner at the International Property Awards 2012, is a small independent company set up to help buyers find and buy property on Gozo and Malta. As an ex-pat and a local, and over 40 years or so of experience, we have an intimate knowledge of the islands and what they can offer, coupled with our insights (outside-in) and (inside-out) on living on these islands. On the move2gozo website you will find a great selection of hand picked properties from apartments and penthouses, to farmhouses, villas and luxury developments in Gozo and Malta, to suit all pockets, and needs. We select properties which are quirky and different, luxury upmarket, or with great potential for re-development. We do not list all properties available in Gozo and Malta, but do have other properties on our books. If you cannot find a property in your preferred location or which suits your requirements then do contact us and let us know what you are looking for. We offer impartial advice, and will inform you of the pros and cons of a specific purchase. We do not abandon you following a sale. We help you from first enquiry through to moving into your home. We can advise on all aspects of the buying process, from sourcing professional resources on both islands, including architects, notarial services, accountants, project-management, builders or artisans, and everything one needs to know about buying and renovating property on the island including registering with utilities, or simply opening a bank account. The best experience you can have is to make an informed decision, and know you have bought the right property for your needs. We want our clients to appreciate the unique charm and character, and have a positive experience from living in these delightful islands of Malta and Gozo. Maltese Homes is a new, young, dynamic Real Estate Agency based in Mellieha. Although Maltese Homes is a new venture, the Management and staff all have many years previous experience working in the Real Estate industry in Malta. Concentrating our business in the North of the Maltese Islands we offer a friendly, local and efficient service, whether you are an owner looking to let or sell your property or an individual looking to rent or buy, our staff are fully trained to assist you every step of the way from initial viewing to final contracts. We are also able to help you find finance to purchase a property. Our Office is based on the Main Street in Mellieha, where we hold an up-to-date database of all available properties throughout the North of the Island. Our friendly team of experienced real estate consultants are able to give you sound advice and assistance supported by specialist advice from Banks, notaries, lawyers, surveyors etc, should you need it. We are also able to offer clients the option of management and maintenance of properties, for those clients who wish to let their property either on a short or long term let basis, but do not have the time to manage the same. So whether you are looking to rent, buy, sell or let, call in and see us and we guarantee to listen to your requirements and do our utmost to help you achieve your goal. Multitrade stocks an abundance of products for the construction industry, including light roofing supplies. Multiwall Polycarbonate, compact polycarbonate, fiberglass, thermonda, tegole and grecato are all found at Multitrade. Whether you have got any queries or require a service, give Multitrade a call – they will be more than happy to assist you. Keep up-to-date with Multitrade via their website, Facebook, Google + and Twitter. "No matter how small or large your pool project is, rest assured that we will treat you like you're our ONLY client". - Charles Micallef. In 1969 Charles and his wife Mary Micallef founded Charles Micallef Swimming Pools Ltd. More than 40 years on, the company is still family-owned and run. Charles Micallef Swimming Pools is in fact one of the oldest swimming pool companies in Europe and has grown to become the most trusted and recommended Swimming Pool companies on the island. With flagship projects like The Malta Hilton, The Golden Sands Resort and Spa, The Corinthia San Gorg and Marina, The Seabank Hotel and Spa, Midi and hundreds of private pools, Charles Micallef Swimming Pools boasts the largest portfolio of both commercial and residential pools in Malta. Winners of three international awards; one gold, one silver and one bronze at the SPATA (overseas catagory) swimming pool competitions. Charles Micallef Swimming Pools Ltd offer over 45years of specialist knowledge and a professional approach to both the design and the technology of domestic and commercial pools. Our expert team can install any size of pool, portable or in-ground spas, saunas, steam rooms and water features as turnkey projects from the initial concrete base through to the most intricate finishing touches. Using state-of-the-art filtration systems and chlorine-free water sanitation equipment, Charles Micallef Swimming Pools Ltd ensure an energy and water saving solution for both pools and spas. These can also be incorporated with highly energy-efficient heat pumps for a total environmental control. We work to SPATA standards in providing optimum filtration and other plant room requirements. Visit us: our friendly staff will advise you on the most efficient ways of looking after your pool whilst also offering you a host of accessories from Automatic Salt Chlorination to LED underwater lighting to ensure your pool is the ideal focal point for outdoor entertaining all year round. Poseidon Pools int. Ltd, located in Mosta, set up shop way back in 1966, effectively becoming the first ever landmark company to tap the swimming pool industry on the Maltese islands. Today, the company continues to work with, for and around pools, providing clients with a wide portfolio of pools to choose from, whether they require a small home pool or an ample hotel/commercial pool. We source and select the best quality products on the market and bring them to our clients at the most reasonable prices. At Poseidon Pools int. Ltd we complement our product range with a unique set of related services, so that new and established swimming pool owners can keep enjoying their pools in safety and peace of mind. We might be family run, we might be 48 years old, but with us, splashing about is still top notch fun. RE/MAX Malta is a Real Estate Agency with 27 offices strategically located throughout Malta & Gozo. The company provides a comprehensive service in the form of residential and commercial property sales and letting as well as ancillary services such as Office Relocation, Property Management and Condominium Services. The company has a team of over 350 sales & letting associates that each specialize in different areas of the market. This, paired with one of the largest property databases on the island, certifies that your RE/MAX real estate agent can easily show you almost any property currently available on the market. FLOCK IMAGE CO. LTD is a leading company in Seamless Flooring Systems on the Maltese Islands.Since starting out in 1996, we have completed a variety of large industrial projects as well as smaller and domestic projects for various industries including: • hotel / industrial kitchens • warehouses storing items ranging from packaged to fresh foodstuffs • meat / fish processing plants • breweries • water bottling areas • electronics assembly areas • pharmaceutical plants • aerospace hangars • domestic garages Our team has wide ranging experience in laying seamless resin and polyurethane floor coatings and we have to date installed around 220,000 sq mtrs of seamless flooring.We can also offer anti-static flooring for the highly specialized electronic industry. A full list of customers with photos and products used can be viewed on our website. Seamless floor coatings provide a range of advantages for the end user, namely: • An easy to clean, seamless surface • Hard wearing and durable (able to take heavy point loads) • Chemically resistant and attractive / decorative As an independent company, Flock Image holds several licenses for a variety of materials. It is these very products, coupled with our unwavering dedication to our clients that have enabled us to build up an impressive portfolio of success stories. We do not just sell the products. We offer comprehensive technical and practical backup that will ensure an application is successful on all levels. With over three decades of building industry experience and using Naici products, The Resin and Membrane Centre ensures that every job is carried out effectively. With a solid reputation in Italy for its expertise in high quality everlasting products, Naici is a leader in resin flooring and waterproofing systems, swimming pool finishes, industrial cleaning products and a vast range of building materials. We at The Resin and Membrane Centre are pleased to offer our clients a range of Naici products, in addition to attention from personnel who provide advice in choosing the right product to meet requirements – whether clients wish to apply it themselves or make use of in-house applicators. A selection of easy-to-apply waterproofing systems are available, which are elastic, can withstand direct bonding of tiles, UV rays, are foot and vehicle traffic resistant, reduce building heat intake, are hassle-free and come with a 15-year guarantee. The range of seamless resin floors is the perfect solution when strength and hygiene are required. Made from quartz sand, they have been tried and tested in a variety of locations. The product range includes:  Professional thermal liquid resin membrane fibre that is reinforced and increases solar panels intake.  Liquid resin fibre reinforced membranes for waterproofing roofs, balconies etc.  Root repellent liquid membranes for flowerbeds and foundation walls.  Resin liquid membranes for waterproofing of bathrooms.  Transparent and water repellent membrane for waterproofing of tiles.  Polyurethane expanding insulation foam.  Cements and resins for waterproofing of wells, swimming pools etc.  Tile adhesives, self-levelling concrete, quick dry cements, polymer sealers.  Stone treatments, stone consolidating spirits and treatments for waterproofing of walls.  Anti-mould products, treatments against raising humidity and Saltpetre.  Vapour barriers against raising damp.  Resin flooring and resin walls.  Epoxy and polyurethane paints.  Industrial and professional cleaning products.  Cleaning products for graffiti, paints, concrete mixers.  Fountains and swimming pool finishes.  Do-it-yourself products. Visit Us on Facebook ! Property for sale direct from owner: 6-Car Garage. Asking price: €77,000 (Lm 33,055 - negotiable). Located in Triq il-Klarissi, St. Julians. A 6-Car Garage measuring approximately 55ft x 23ft. Situated in St. Juliants, limits of San Gwann behind San Gwann’s petrol station. Lighting and electric garage door already installed. 3-Car Garage with permits for shop in Paola. Asking price: €95,000 (Lm 40, 750 - negotiable). Street level 3-Car Garage with permits for Class 4 Shop with the area of 76.5sqm. Maisonette in Mellieha ‘Tas-Sellum’. Asking price: €104,800 (Lm 45,000 – negotiable). Property located in ‘Touch of Class Court’, Plot 30, Triq il-Barzakka, Mellieha. Semi-basement maisonette consisting of kitchen/living, 2 double bedrooms, bathroom, back terrace with views of Ghadira Bay. Finished, including bathroom and internal doors. Common areas ready. Apartment in Fgura. Asking price: €100,500 (Lm 43,144 – negotiable). Property located at Apartment no.1, Triq Louis Scicluna, Fgura. Consisting of a very large open plan kitchen/living, 3 bedrooms, ensuite, large bathroom, front balcony and back balcony. Finished with marble flooring excluding bathrooms and internal doors. Common areas ready. Apartment in Qawra. Asking price: €116,500 (Lm 50,000 – negotiable). Property located at ‘Ocean Drive Complex’, No.7 Block C, Qawra Road, Qawra. Situated on the 3rd floor when one looks at the apartment from the internal common piazza. Consists of a very large open plan, 2 bedrooms, large bathroom, large front balcony. Finished. Common areas ready, including lift. Flat in Birguma including optional 1 car garage. Asking price: €186,500 (Lm 80,000 – negotiable). Located at Birguma Heights Apartments, Triq Andrea Debono, Naxxar. 3 bedroom apartment measuring approx. 140sqm. Consists of large open plan kitchen/living, 3 bedrooms, ensuite, large bathroom, 1 front balcony. Finished, including bathrooms and internal doors. Common areas ready including lift. For more information kindly contact owner directly on 99852783. Godwin`s Garage is the largest vehicle rentals and leasing company in Malta with more than 600 vehicles based in Malta and its sister island of Gozo. Our organisation offers both rentals and leasing services. The latter ranges from short-term vehicle rentals both for personal or corporate sector. The company has been established for the past 15 years, and is a leader in the rental of commercial and private vehicles. Godwin`s Garage offers a range of light and heavy commercial vehicles, special purpose vehicles and specialised industrial machinery (boom lifts, cherry pickers, cranes, fork lifters and scissor lifts). The equipment can be either battery or diesel operated according to the customer’s needs. Our rental arrangements are covered by fully comprehensive insurance, weekly maintenance and service and weekly washes, amongst other benefits. Ta’ Skriepel Properties offer various types of property for sale including maisonettes and 2/3 bedroom flats in Gozo. Ta’ Skriepel are also renowned building contractors and turnkey contractors, and carry out excavation works. Standing some 400 feet above sea level, crowning the top of a hill is Wardija Hilltop Village modelled on the traditional Maltese village and incorporating many of the architectural and visual features which have made these age-old Mediterranean settlements famous the world over. There are few places abroad where one feels instantly at home and one is at peace with the world. 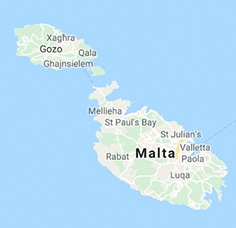 The Maltese village is one of these places - and so is Wardija Hilltop Village. Carved out of the slopes of a hill, it is an exhilarating Holiday Complex in Malta to stay in, with its all-round panoramic views of the sea on both sides of the island and of the long green valley which runs between Golden Sands and St. Paul's Bay with its picturesque harbour. The complex includes large outside living rooms or terraces, so all may take advantage of one of the great pleasures in Malta - being able to spend so much time living and dining outdoors while enjoying views of terraced fields towards Golden Sands Bay and Xemxija Bay. The terraces have been planned as an extension of the living space. There are at present 25 apartments which have been planned so that the utmost advantage may be taken of the views of the sea and countryside. The complex has an outdoor swimming pool with a children's area, as well as a mini-market and a well stocked bar. Here, a hilltop village modelled on the traditional Maltese village is awaiting you for the most relaxing and stimulating holiday ever in Malta. Who We Are? Gold Lion Holding is no ordinary group of companies-its essence is to ease the overall customer experience by converging all property related services under one roof. Gold Lion Holding’s partners possess a diverse, rich portfolio of businesses around the globe. Ranging from import & export, aviation to finance, Gold Lion Holding’s strategy is being defined by leading international business experts. Our journey in the Maltese property market began with the launch of our real estate division: Gold Lion Real Estate. A comprehensive market research was conducted to classify the target market, property trends, current players and other relevant variables. We identified service gaps in many dimensions and formed Gold Lion Holding to fill those very gaps. With the launch of Gold Lion Real Estate, Gold Lion Construction and Gold Lion Property Development, we differentiate ourselves with a business model that is not only strategic in nature yet effective in business execution. We believe strongly that silo vision is an organisational barrier and restricts a company in achieving its true potential. At Gold Lion Holding, all divisions and departments work in sync and enjoy openness in transparency, communication and information sharing. An integrated, motivated workforce will accomplish incredible milestones and take the company to new heights of success. How are we different? Our focus is simple. We aim to provide you with a great customer experience. But we try to go one step further. How? By inspiring to build a community. Social responsibility is one of the core values of our company. Gold Lion Holding strives to create a community of cooperation and collaboration through such events. We hope to inspire other companies to join our social efforts and make a positive difference in Malta. This is the mindset of our team; no matter how large or small business is, we can all come together for a good cause. Treat yourself to a wonderful time in the idyllic atmosphere of Xaghra, Gozo. We have three farmhouses to let, all of them with swimming pools. Two of the farmhouses have five bedrooms, while one of them has three bedrooms. All the bedrooms have ensuites. Every farmhouse is fully furnished and has a BBQ area, TV, washing machine, microwave, kitchen, etc. Come and relax and wind down in one of these magnificent farmhouses. Excellent prices! Gozo Pride Holidays are your unique partners for the choice of a relaxing, mind resting and enjoyable holidays on the undiscovered island of Gozo, Malta. We offer you a wide selection of farmhouses, villas and luxury penthouses with private pool or with sharing pool having different amounts of bedrooms to suite your needs. Gozo Pride Holidays boasts of superlative care for all its customers. Choosing our services will offer you an extensive range of airport transfers, car hire and excursions in Gozo. e-Volve Malta is a specialist accountancy and consulting firm that focuses on companies established by non-resident shareholders seeking to benefit from Malta’s excellent tax regime and regulatory framework for online gaming concerns. We seek to deliver value, excellence and creativity. We have developed a range of services that new firms in Malta normally require: Tax opinions; Assistance with angel investment and venture capital registration; Management of companies; Provision of VAT registration and return; Leasing of serviced office space; Sharing of staff resources; Tax planning; and Negotiating and delivering preferential rates from Maltese suppliers as well as bespoke accounting service packages. Homes of Quality forms part of the Frank Salt Real Estate Group. The focus of Homes of Quality is on quality upmarket properties that offer good value for money. These could be anything from a top quality studio apartment to a lavish seafront villa. Established in 2002, Homes of Quality operates from their vogue office on the Sliema seafront and offer a bespoke service to its niche client base. The company prides itself in giving a comprehensive service to their clients, both local and foreign, covering not only the sale or purchase of the property but also providing a full range of ancillary services such as property management and project management. Though closely associated with reputed professionals, HOQ also offers consultancy services, be it on home loans, relocation assistance, as well as tax and legal advice. Client referrals is the core source of leads for the company, whose sole mission is that of excelling in its service promise, through a consistent and genuine commitment to customer satisfaction, following the highest professional standards. Ta’ Gulinu Farmhouse: Located in the Gozitan village of Qala, situated towards the centre of the village and within walking distance of Hondoq Bay. Spread on three floors that forms part of a gated complex, one can find a good sized swimming pool equipped with a deck/BBQ area, kitchen/dining/living, 4 Double Bedrooms, 3 Bathrooms, spare toilet and a terrace overlooking the pool. Ta’ Karmena Farmhouse: Located in the Gozitan village of Qala, situated towards the centre of the village and within walking distance of Hondoq Bay. Spread on three floors that forms part of a gated complex, one can find a good sized swimming pool equipped with a deck/BBQ area, kitchen/dining/living, 2 Double Bedrooms, 1 Twin Bedroom, 3 Bathrooms, with a terrace overlooking the pool. Established in 1967, Belair Real Estate boasts an experienced professional team that offers a dedicated personal service to its customers who are renowned for putting emphasis on understanding what the client is looking for. We have a large and varied portfolio of all types of property for sale in Malta & Gozo, are selling agents for all the leading developers and our website is updated on a regular basis. As a leading specialist estate agency, we focus on our core business through various contacts with foreign property buyers who seek to buy for holiday, retirement and even work purposes. Belair participates in many exclusive overseas property exhibitions and has collaboration agreements with various UK and European property agents. For all types of shutters, aluminium apertures, aluminium roller shutters, windows and doors for domestic use. Also aluminium roller shutters for garage doors and shops – roller or ceiling system. New Products: Security Doors, also available in fine resistant aluminium outside, wood inside. Thermal insulation reduce heat in summer and cold in winter also free from condensation. John Micallef entered the construction industry under the company name of John Micallef Builders Ltd in 1994 with the launch of a small construction firm capable of handling small projects. However, the company quickly evolved and embarked on greater projects. John Micallef Builders Limited forms part of a group of companies based in Malta. This group is mainly engaged in providing construction services and property development. John Micallef Builders Limited is the construction arm of the group. Its main activities are to provide construction services, both to third parties and to other group companies. It boasts several large building projects, including the construction of factories, a winery, and several residential blocks. Currently the company employs around twenty full-time employees ranging from steel fixers, shutter fixers, truck drivers, crane drivers, labourers, masons, foremen and draughtsman. Boasting a vast selection of heavy vehicles and machinery and employing a highly skilled taskforce, the company can assure its clients to remain satisfied with the quality of the service it provides at the most competitive prices in the market. Other services offered include private residential and commercial developments, property for sale and skip hire. Muscat Pools specializes in Pool & Spa Construction finishing and repairs for both Roof Top and inground pools. Unlike other pool builders Muscat Pool Construction is self-sufficient. We have all our own tools, equipment and vehicles and do not rely on sub-contractors. This allows us to deliver a personalized and dedicated service. We also supply Salt Chlorinator Systems. Salt Chlorination Systems uses common table salt to produce all the chlorine your pool needs, right in your pool - safely, effectively, and automatically. Same sanitation performance as manual chlorine addition without the drawbacks. No need to buy, transport and store expensive chlorine compounds. No more odour, stinging eyes, irritated skin and bleached out swimsuits. For more information call or visit our website or facebook page. Gozo Pools has been in business since 1995 and specialises in swimming pools, spas and saunas. The staff offers quality and reliable products and services you can count on. Whether you need a new swimming pool installed, maintained or repaired, a new spa installed, a sauna built or simply chemicals or accessories associated with these products, Gozo Pools have what you need at prices you can afford. At Gozo Pools, the goal is to provide all clients with courteous, expedient, professional service of the highest calibre. The customer always comes first and the aim is to reach your expectations with a high quality service. Offering a huge variety of pool equipment and garden furniture, looking after your pool and furnishing your decking area have never been easier.